I hate Mutons. If you play XCOM: Enemy Unknown, you probably hate them too. The big, green, ape-like aliens are the shock troopers of the invasion, and they will make you cry. They'll flank and shellack your team, lob grenades into places you thought were safe, and cut down your most beloved veterans in a heartbeat. After doing it, they'll pound their chest like gorillas and crow over their victory. I hate when they do that. And yet even as I seethe and attempt to recover, I have to aknowledge that the enemies in XCOM are all very, very well done. They have an identity, a certain pang of dread that they each inspire. A huge part of that identity is derived from the sounds that they make. Over the last month or so, I've grown intimately familiar with the various enemies in the game, particularly the foes from the first 2/3rds of the campaign. The people at 2K were kind enough to share some of sound designer Roland Rizzo's work on the game. I thought it would be fun to look through the monkeys and machine guns that inspired XCOM's perilous soundscape. Rizzo is an old hand at XCOM—he was at Microprose from the early 90's through the early 2000's, and as a result worked on the entire run of the franchise. "I'm not trying to produce the same sounds [as the original game]," Rizzo said in an interview with Game Informer, "but the same feel." He's succeeded. 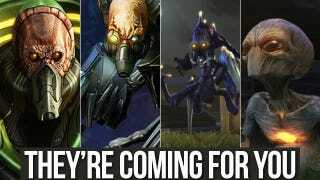 Mutons have long been some of the most fearsome enemies in the XCOM universe, but the new breed are easily the most aggressive and animalistic. That comes from gorillas—an influence that will come as no surprise to anyone who's played the game. Floaters are more bark than bite, for me—I always seem to be able to come up with a good way to take them down. Maybe it's just because I'm playing on normal difficulty. As I list these enemies, I keep going from bad to worse. And now we come to Chryssalids, the highly mobile, insectoid monstrosities that will A) kill your squad B) turn civilians into hard-to-kill zombies C) move like FIVE THOUSAND SQUARES IN A SINGLE TURN and D) generally ruin your day. Believe it or not, Rizzo used the sound effect of a shovel biting into the ground for the Chryssalid sound effect, then added some bass to convey the creatures' size. That is one menacing shovel. I loved John Broomhall's creepy, droning electronic music in X-Com: UFO Defense. And I love, just as much, the many ways that the new score, composed by Deus Ex: Human Revolution composer Michael McCann, stays true to the vibe of the original while smartly updating it. Whilst on a mission, XCOM has two musical modes: tactical music and combat music. If there are no enemies in sight, the brooding, tense tactical music plays. The moment you spot one, the more intense combat music kicks in. McCann has done some fine work with both—the tactical music is suitably creepy, and the tension builds until it's unbearable. This is probably my favorite of all of the combat tracks—driving, exciting, with just a touch of superhero to it. As my team moves into position, flanks the enemy, and takes down a lurking floater with a one-in-a-million shot, I fist-pump every time. Brilliant. As I've said before, one of my favorite things about XCOM: Enemy Unknown is that second part of the name—with every mission, the enemy is unknown. As you air-drop into hostile territory, things are quiet… too quiet. Your squad moves about the battlefield, and from the distance comes a growl. There's something out here with us. The music, and the audio, plays such a huge part in setting the stage for the agonizing, cathartic battles to come. Kudos to Roland Rizzo, Michael McCann, and the rest of the team at Firaxis for embracing the scary sounds of the past in order to breed a new kind of fear. Okay, time to go kill some more Mutons. Teach them to taunt me.